Casa del Mar loves its communities. For that reason, we have created a simple fundraising program to give back. It’s a quick, easy way to help youth clubs, school activities, sports teams, and other eligible groups. Your fundraising group will be paid 15% on all revenue (excluding taxes & tips) your group brings in. Available days include: Sunday, Monday, Tuesday, and Thursday. There is NO limit on how much you can earn. READY TO GET STARTED? Download the signup form below, and return it to the desired fundraising location to register. 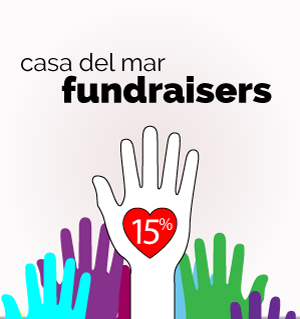 Casa del Mar wants to assist you in having a successful fundraiser. Below are some tips and suggestions to help you reach your full potential. - Grab a flyer and fill in your organizations name and scheduled date. Check the flyer download links below. REMINDER: At payment, customers must forfeit a copy of the flyer to count towards the fundraiser. - Hand out and email the flyer to all of your group members and post it on all of your social media outlets. - Encourage everyone to invite friends and family via Facebook and other social media sites. - Send out the flyer again to all of your group members and post it on all of your social media outlets — a timely reminder! - One last time, send out the flyer to all of your group members and post it on all of your social media outlets. Be sure to invite friends and family. REMINDER: At payment, flyer must be forfeited to count towards the fundraiser. At NO TIME are flyers allowed to be distributed inside or outside of the restaurant on the day of your fundraiser.